Welcome to our two luxury holiday villas in Sicily. Enjoy an authentic Sicilian experience in true comfort and style. Welcome to Villa Santa Maria, a 17th century fortified farmhouse which is now a beautiful holiday villa in Western Sicily. With its honey-coloured turrets, this castle-like property tucked away in the Sicilian countryside is certainly unique and provides plenty of space and opportunity for total relaxation. There's a palm-fringed private pool, a tennis court, a lush Mediterranean garden and even a pine avenue leading to a 16th century tower. Walk through a romantic courtyard to the ground floor villa, which accommodates 6-8 people in 3 beautifully-decorated suites. A canary yellow living room and dining room leads out onto an orange and lemon grove, the perfect setting for al fresco Sicilian lunches and dinners. A Chinese library is lined with books, and the huge kitchen is fully equipped, making cooking for the whole family an absolute pleasure. Villa Santa Rosalia is a large family villa set in expansive grounds with its own pool, in the Sicilian countryside. Once an annexe of the 17th century villa next door (Santa Maria), it has been renovated to a high standard with families and children in mind. Four double bedrooms, three spacious bathrooms and plenty of living space on the ground floor make it a comfortable option for a family holiday. With the optional studio bedroom it can sleep up to 10 people. Foodies will love the fully equipped kitchen that overlooks the pergola and pool. 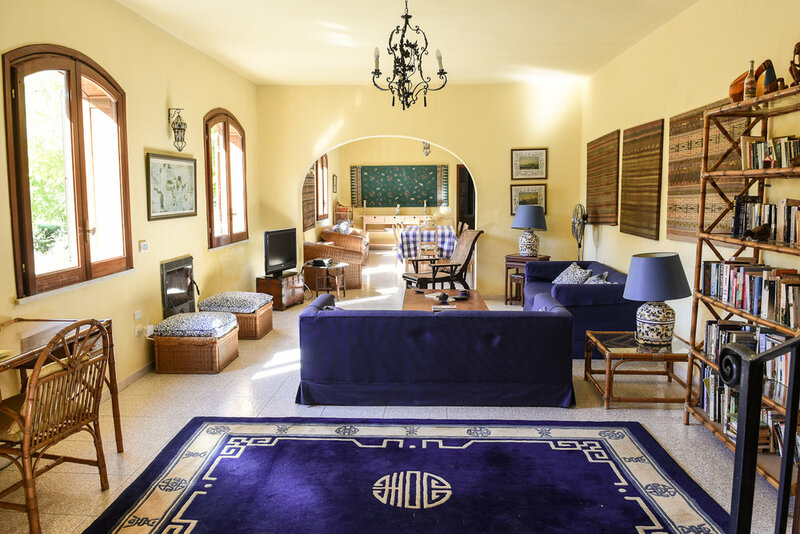 Villa Santa Rosalia has its own private entrance and a garden dotted with olive, pomegranate, fig and orange trees, bordered by lofty pines and cypress trees. The 11 x 6 m pool, surrounded by olive trees and lavender, is fenced in for safety and is in full view from the alfresco dining area framed by a vine-covered pergola.